Donald Hamilton Fraser RA remains one of the most distinctive and enlightened artists that post-war Britain has produced. The Royal Academician enjoyed a long and successful career which spanned over fifty years and this exhibition brings together some of the finest examples of his painting and printmaking. Bohun Gallery's careful selections highlight the artist's diverse technical approach illustrated by almost purely abstract paintings juxtaposing with classical representations in a variety of medium. The exhibition features not only his jewel-like landscapes, for which he is best known, but also still lifes, figures and a group of work devoted to his affection for the ballet. âOne looks with the eyes and sees with the mind' is a phrase Donald Hamilton Fraser used to describe his artistic practise and one which is regularly associated with his work. He sought to convey more to the viewer than a topographical view or painterly snapshot. Instead his powerful compositions vibrate with colour and provide us with the very essence of the place. 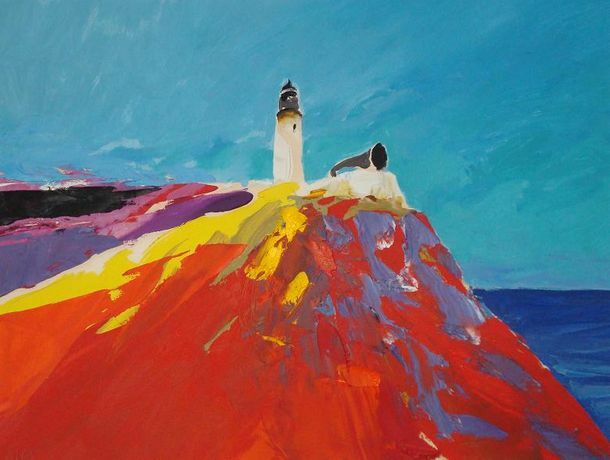 The show features a selection of his most dramatic locations, to which he often returned, including the northernmost coastline of Scotland, Greece, Venice and even a view of the Thames at Henley, where the artist lived for much of his life. His intensified vision evolved with bold sweeps of the palette knife combining angular lines, daring and experimental use of colour. It was often acknowledged in his early career that he painted as though he were in love with the paint itself. Bohun Gallery has exhibited Donald Hamilton Fraser's work throughout his working career and has continued to work with his Estate since his death in 2009. His importance was recognised during his lifetime and he was made an Honory Fellow of the Royal College of Art in 1984 and a Royal Academician in 1985 where he also served as Honorary Curator and a Trustee.